The threat of pieces from the Detroit Institute of Arts being sold off popped up in the news again today. I've been stewing over my professional response for a few months. (I used to curate exhibitions and deal American works of art — artists like Alexander Calder, William Merritt Chase, Mary Cassatt with "mid level" price points, $30,000-500,000. One of my previous clients is a well-known collector and avid supporter and lender to the DIA). When asked, I gave my personal response. Personally, I was adamantly against it. It seemed like a cop out to commodify our regional treasures. Like many in the art community, and particularly those of us that have visited the DIA and relish memories and works from the collection, I was vehemently against this ghastly idea. At first. Now don't get me wrong. I still think it's terribly sad and agree with the Museum that it may have a detrimental effect on Detroit's daily and longterm economy but there are a few silver linings, at least from an art world standpoint. Here are a few reasons why. WE DON'T GET TO SEE MOST OF IT ANYWAY. Museums are fancy storage facilities with exact humidity and temperature control. Some things they show, the majority they do not. They simply can't. During conversations with colleagues in the industry, I've heard estimates that the Art Institute of Chicago shows less than a quarter of its collection. The DIA has 66,000 of which 35,000 are said to be owned by the city and being evaluated for condition and appraised by Christie's. I don't know exactly how much of their collection but we are indeed missing the bulk of it when we visit. THESE ART WORKS WILL GET THEIR DUE SPOTLIGHT. Auctions are the barometer of the art industry accounting for about 25% of the market. Even though only a minute percentage will ever dabble in multi-million dollar bidding wars, when auctions do well, the trickle down effect for the art industry is a good one. It's estimated that in 2012, the art industry did $64 billion. If and when the DIA's paintings, sculptures, drawings and objects go to auction they're going to be waltzed across a global stage. Every collector that will potentially ever want that piece is going to be watching and that's just what those pieces deserve. But only seven* of them can afford it. Five of them have capped themselves. That leaves two bidders (on the phone, have a dealer bidding for them on the phone, are sitting on the internet or waving their paddle wildly in the crowd) to fight over it. That's how much a painting is ever worth - how ever high two people with an agenda are willing to go. When people start to read about art being used as a commodity, our ears can't help but perk up and we start to take more interest. People start to notice their blank walls, think about acquiring art at the next fair, see themselves joining the exclusive club. Being a "collector" is a status symbol and we all want to be a part of it. With the sale of DIA works, we're going to think twice about taking our public collections for granted. Or so the recent media attention says. 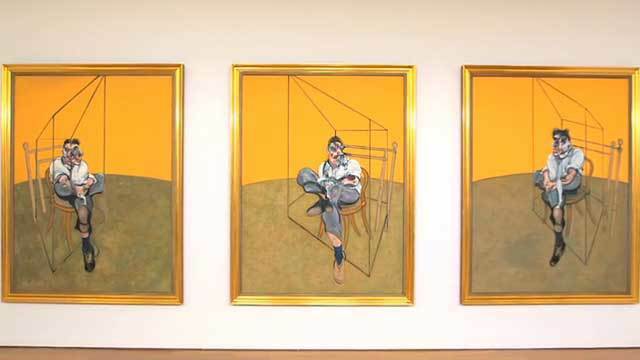 *There were indeed seven battling bidders that pushed the Francis Bacon to break the record for any piece ever sold, ending at $142.4 million at Christie's earlier this month (this includes the 12% buyer's fee). YOU (OR YOUR GRANDKIDS) WILL SEE THE WORKS AGAIN. AT ANOTHER MUSEUM. Museum-goers (aka common folk like me) sometimes complain that when things are bought privately, we never get to see prized works ever again. Recently, certain tax laws have made it less savory to donors to bequeath their paintings, but there are and will always be collectors that want to leave a legacy. And because art is cyclical in nature (i.e. genres come in and out of vogue, estates unearth works of art to be auctioned off or bequeathed to museums, children sell their parents' collections, curators thrust exhibits into the limelight requiring loans of works from private collections) it's likely your favorite DIA piece will one day see the light of day, at a museum, again. GOING BACK TO START. I don't like the idea of pieces being sold because they have to be either. I love the feeling of going to the DIA. I don't even have to look at any one work for a long amount of time, I just like to breathe in the atmosphere of the American wing and odors of oil. I just have to remember and keep telling myself, the DIA won't go away and the sale of many pieces would be a PR boon (albeit another sad one) for Detroit. I've decided to look at this like everything else that involves the impending bankruptcy, brazen upstarts and savvy entrepreneurs — this could be an opportunity for the Museum to garner new art, new donors, a fresh start.